Many times when I meet people and mention how much I love knitting, I often hear them express a wish to learn the craft, although I’ve yet to hear a Maltese man say so. Anyway, there are also many times when these same people say that they wish to take knitting up again but give up due to skipping stitches, etc. Well, I always try to encourage these people to pick it up/again. It’s not that difficult to learn how to knit – all you need to know are how to cast on and bind off, and how to knit and purl and you’re good to go! Then you can progress easily from there; however, I do appreciate a well-structured instruction manual myself and I cannot tell you how much I love this fantastic book I bought recently. 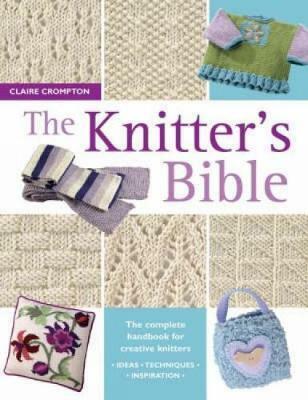 It’s called The Knitter’s Bible by Claire Crompton and it’s got everything you need to know to learn basic to intermediate knitting. To be honest, I already knew most of the techniques in the book but it did show me some other new stuff which I’m so excited about, especially the stitch library. I highly recommend this book if you want to get started from scratch or you want to pick up knitting again and refine your basics as well as move to an intermediate level. Seriously people, you need this book in your library!